The pistol pictured on this page is the Model 1930 or M-30. It is the first C-96 variant to have an official factory designation in that the Germans called it the "Modell 1930". This particular version of the C96 was only produced between 1930 and 1937. It is estimated that approximation only 121,000 of these were ever manufactured. The M-30 is a semi-automatic pistol that is chambered for the 7.63 x 25mm Mauser cartridge. The M-30 features a 10 round internal magazine that is fed from the top of the pistol. The grips are made from Walnut. The M-30 is nearly identical to the Prewar Commercial C96 except for some small changes which included the introduction of the new universal safety. The Mauser company never sold a new firearm as a "prewar commercial" as this terminology is modern, but it is widely used by collectors to help them in the understanding of the many different variations of the C96 pistol. The C96 series of pistols were manufactured from 1896 to 1936. This semi-automatic pistol design was one of the first to see widespread use. The main features that distinguish the C96 from other semi-automatic pistol designs is the location of the integral box magazine which is in the front of the trigger, the long barrel, the wooden shoulder stock which can double as a holster and carrying case, and a grip shaped like the end of a broom's handle. This grip shape earned the C96 the nickname "Broomhandle". The C96 was designed by the Feederle brothers, Fidel, Friedrich and Josef Feederle and known then as the P-7.63 or 'Feederle Pistol'. It was later renamed by Paul Mauser to the 'Mauser Military Pistol' in the hopes that the pistol would achieve large scale sales by its adoption as an official German military issued sidearm or for that matter, a sidearm officially issued to the military of any nation. The only time that the C96 was officially used by the German army was in WWI. During this time, the Imperial German Army contracted with Mauser for the manufacture of 150,000 C96 pistols that were chambered for the 9 mm Parabellum. This variation of the C96 was called the "Red 9" after a large number "9" was burned and painted red into the grips. This was done to prevent the users of the pistol from loading them with 7.63 mm ammunition by mistake. Of the 150,000 pistols commissioned by the German Imperial army, approximately 135,000 were eventually delivered before the war ended. Within a year of its introduction, the C96 pistol had been sold not only to many different governments, but also commercially to civilians and military officers from around the world. As a military sidearm, the pistols saw service in various conflicts around the world including colonial wars, World War I, the Spanish Civil War, the Chaco War, and World War II, among other places. In 1897, the Ottoman Turkish government purchased thousands of C96 pistols. In 1899 the Italian navy purchased 5000 C96 pistols. The C96 was sold to Russia in large quantities. The Chinese used the C96 in the Second Sino-Japanese War and the Chinese Civil War as well as during WWII. The C96 was used by the Indian revolutionaries during the Indian independence movement. Leaders like Bhagat Singh, Chandrasekhar Azad, Asfhaqulah Khan, Sukhdev Thapar and others used Mausers that were smuggled in from China. The C96 Mauser was favored by the Jewish armed guards in the Ottoman Palestine and the paramilitaries of Haganah during the British Mandate of Palestine. Even Winston Churchill favored the C96 Mauser, and used one at the Battle of Omdurman and during the Second Boer War. Lawrence of Arabia is on record as carrying an ex-Turkish Army Broomhandle Mauser. The list of places and the peoples that used this firearm design or a variant thereof is nearly endless. Even today, this pistol turns up in movies on TV and in the big screen. The Star Wars fans out there may notice a huge resemblance between the C96 pistol and the BlasTech DL-44 heavy blaster pistol that Hans Solo and Luke Skywalker used, except that their pistol had a lot of futuristic gadgets attached to it. All of the Mauser manufacturing and corporate records that were retained at the Mauser plant was destroyed in 1945, by order of the U.S. Army officer in command at the captured Mauser plant. Since all of the records were destroyed, many collectors of the C96 Mauser have tried to date their Mauser by the serial number, but many of those attempting to do so have run into a dead end. During the early years of C96 production, the Mauser pistol was not popular and sales were slow. In an attempt to encourage more sales, Mauser skipped blocks of serial numbers to make it appear that more pistols had been sold than was actually the case. To make it even more difficult for the collector of the C96. 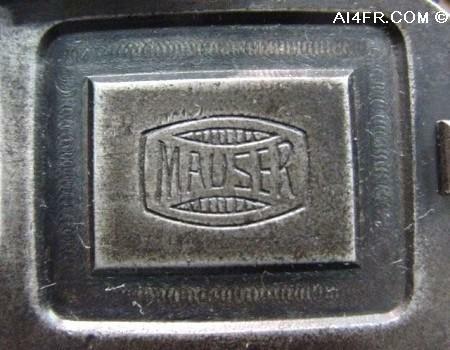 it appears that some attempt was made by Mauser to fill in these blocks of serial numbers in later years. Although it does not stop there, pistols that were made under contract were usually(but not always) serial numbered in their own series, beginning with number "1". What I am trying to convey is that pistols which might appear, based on their serial number, to have been made early may in fact actually have been made much later. The reverse also holds true. All firearms tend to evolve over the years of its production. These changes are done for a variety of reasons, such as to improve function or appearance, to save on both production costs and time and so forth. This holds true for the C96 Mauser as a large number of changes were made in its 40 year production history. This included not only the above mentioned changes, but also the size and font of the markings and where they were stamped on the pistol and the shape and physical size of some of the parts. For example, at least four different types of safeties were produced, and even the milling patterns on the frames had changed over time. Knowing when some of these changes were made can help the collector learn the history of his particular C96. 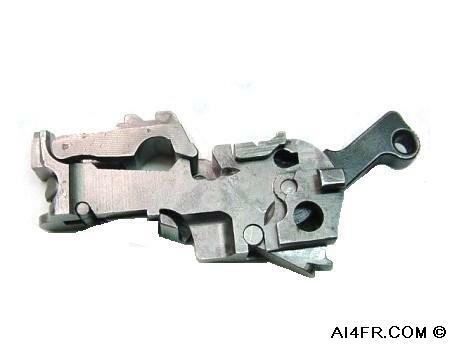 Trying to date a C96 by the parts that is found on it is not with-out problems either. There are instances when Mauser would make a change to the C96 and produce several hundred to several thousand pistols with these new changes and then revert back to the old way of making pistols. Then after a few dozen or a few thousand was made, they would then go back to making the pistols with the changes from earlier. 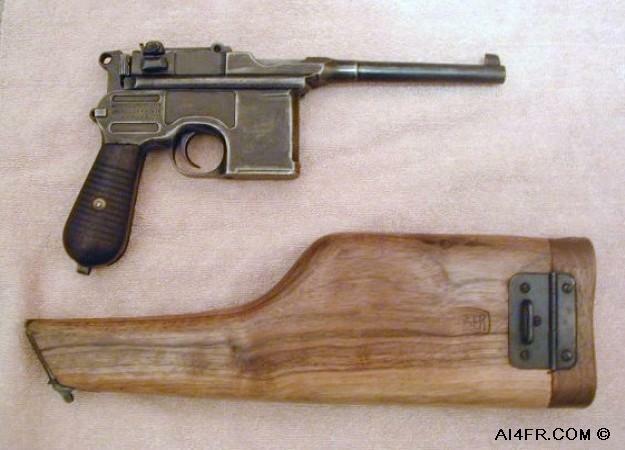 It will appear to the researcher that Mauser had found a dusty box of forgotten parts in some corner of their warehouse and used these parts until they ran out at which point they would go back to the normal production of the C96. Now to even add insult to injury, did I mention that the Chinese made a copy of the C96 and stamped them with the Mauser logo and markings? What I am trying to say is that it is often next to impossible in many cases to determine the actual year of manufacture for a particular C96 Mauser. Being that this is the M-30 version of the C96 we know that it was made some time between 1930 and 1937. Going by some of the parts that are installed on this pistol as well as the location of the serial number and other stampings, this pistol turns out to be on the late side of the early version of the M-30. So a rough guess would put the year of manufacture at or near 1933 or 1934. The picture on the left is a marking that is on the right side of this pistol. 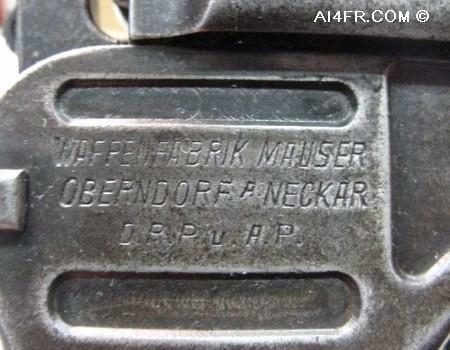 The marking reads as follows, WAFFENFABRIK MAUSER OBERNDORF A. NECKAR. Then under that is the D.R.P.u.A.P. The marking "WAFFENFABRIK MAUSER OBERNDORF A. NECKAR" translates to Mauser Weapons Factory in Oberndorf on the river Neckar. The "A. NECKAR" is an important marking as there are several Oberndorfs in Germany and Austria, but there is only one Oberndorf on the river Neckar in Germany. The letter "A." is an abbreviation of the German word "am" meaning "on". The "D.R.P.u.A.P." stands for Deutsches Reichs-Patent und Auslandische Patente which translates to German Patent and Foreign Patents Indicating that the pistol has patent registration in Germany and in foreign countries. The picture on the right is found directly on the opposite side of the pistol from the markings in the left photograph and is of the Mauser logo. Mauser used two different style of banners on the M-30 pistols that have been classified by collectors as an early style and a late style. The Mauser logo seen in the right photograph is the early style and exactly the same as the logo that is stamped on the wooden holster at the top of this page. Please click here to see both sides of this holster. 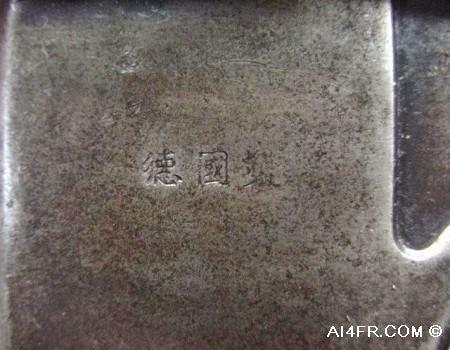 The photograph on the left is of the three small Chinese ideographs stampings that indicate "Made in Germany". The first two characters on the left go together and translate to "Germany", while the one at right is "manufacture". This marking is found on the left side of the magazine. At the present time, I do not know what the marking in the right picture indicates. The photograph on the left is of the number 11 in a circle. At this time I do not know what this marking should indicate. The photograph on the right is a picture of a crown over the letter U stamp. This stamping which became law on April 1, 1893 is the final or definitive proof. This mark has not been in use since the proof law of 1939 became effective in Germany. The new proof law appeared in the Reichsgesetzblatt(Reich Law bulletin) No. 126 on July 15, 1939. The new proofing law stuck with the old concept that no small arm which has not been proofed by a state recognized proof house can be brought into general commerce and cannot be sold if it does not bear appropriate proof marks. 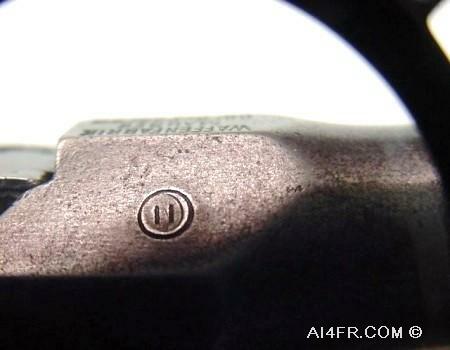 Each firearm that has passed proof firing must be marked with the suitable mark or stamp. The new proof law calls for marking each of the important parts on a firearm that underwent proof firing, and the parts of the firearm that underwent separate proofing must be marked with the appropriate stamp after passing the tests. 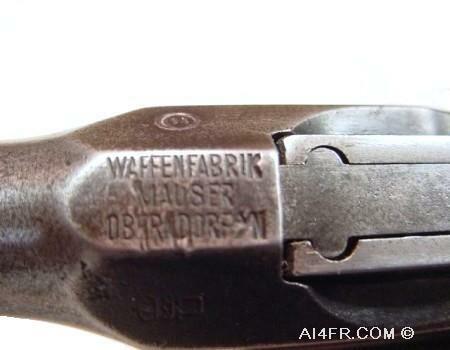 The marking on the top of the barrel flat which is directly over the chamber reads as follows, "WAFFENFABRIK MAUSER OBERNDORF a/N" which translates to Mauser Weapons Factory in Oberndorf on the river Neckar. The "a/N" is an important marking as there are several Oberndorfs in Germany and Austria, but there is only one Oberndorf on the river Neckar. The photograph on the right is of the rear tangent sight that is calibrated from 50 to 1000 meters. 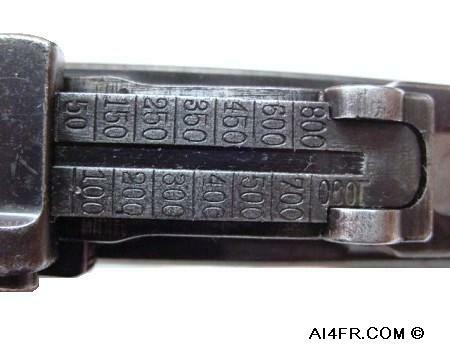 As with a lot of the Mauser C96 or M-30 parts, there was numerous different variations that were produced. Notice on this rear sight that there is no 900 meter mark and that the 1000 mark is read from the left side of the pistol. Other variations of the C96 pistol to include the late Prewar Commercial, Wartime Commercial, Postwar Bolo and some M-30 pistols have the 1000 mark being read from the right side of the firearm. In other words, the 1000 meter mark has been rotated 180 degrees from the picture above. All of these different C96 pistols sights including the one featured on this web page appear with the bimodal curve ramp. 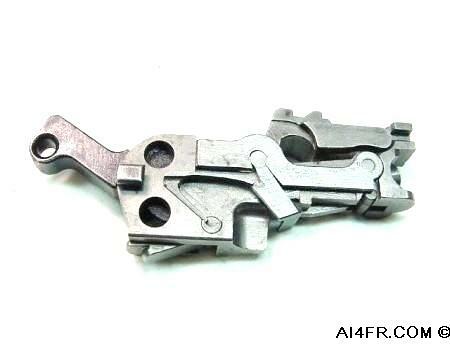 These next two photographs show both the left and right side of the M-30 lock frame. 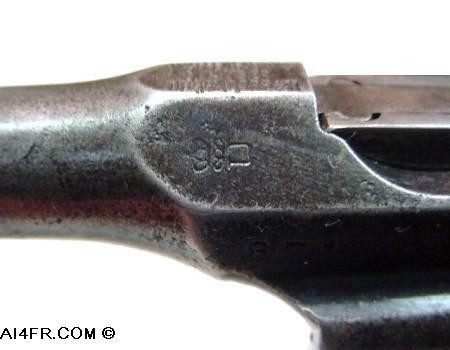 To give the reader an idea of where this part is found on the firearm, the hammer is the blued item on the far right edge of the photograph on the left. As the reader can tell, a lot of hours were put into the production of these C96 style pistols. It has often been stated with other firearms made in yesteryear, that if a similar item was produced today, it would put the price tag far beyond the reach of the average shooter or collector. The photograph on the left is another unknown marking. This one was found on the back of the hammer. 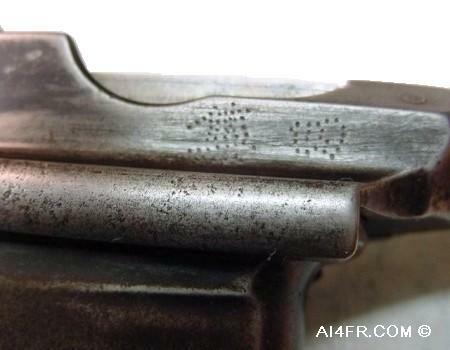 It is difficult to fully bring out this mark in a photograph but it could consist of two interlaced letters, "M" and "W" which might stand for "Mauser" and "Werke", Or is it a Chinese character? At this time it is still a mystery. 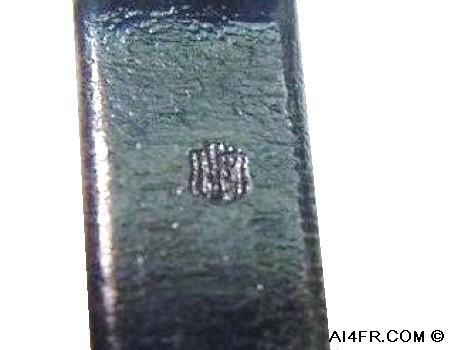 The photograph on the right is a close up of a marking that is found on several of the parts on this M-30. This picture is actually a close up of the picture on the left from above. The mark can be seen on the far left of the lock frame in that picture. 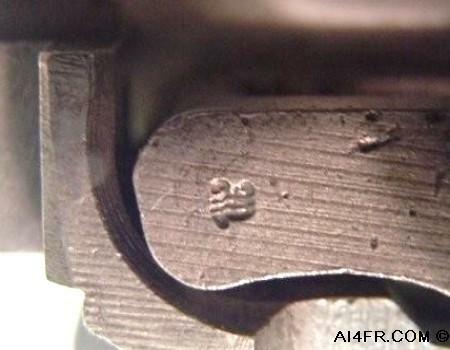 I do not know what this marking should indicate but at a guess and since it is found on many of the parts, my first impression is that it is some type of inspectors mark. These old items will speak to us in their own way and will tell us their history. Although it is difficult at times to fully understand exactly what it is they are trying to tell us. When this happens we must put our nose to the grindstone and dig into the research of the item. This is where I am at now with this item and will report back when I have uncovered some more of the mystery of this particular M-30 pistol.